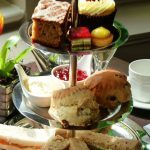 Gather up your friends and treat yourself to a divine afternoon tea at the Crown Hotel, Harrogate. With a rich history stretching over 300 years, it is undoubtedly one of the town’s finest Grand Dames. Boasting sweeping views across the majestic Montpellier Gardens, it is one of best spots to appreciate this elegant town. Afternoon tea at the Crown Hotel is served in the hotel’s stylish restaurant, The Place. Informal and relaxed surrounds, enjoy a little me time as the friendly staff provide an attentive service. 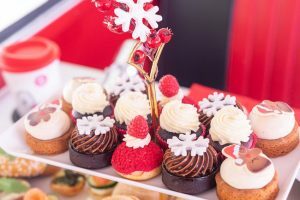 Your truly scrumptious afternoon tea is served on elegant tiered cake stands bedecked with fresh, seasonal savouries and mouthwatering sweet treats. The Crown Hotel serves a variety of afternoon teas which include a traditional Yorkshire afternoon tea and Gentleman’s afternoon tea. Something to celebrate? 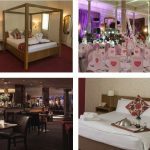 Be sure to ask about their family celebration afternoon tea or their wedding and hen party teas. The chefs are also happy to cater to vegetarians so be sure to let them know of any dietary requirements. Scone, Clotted Cream and Jam. Served with your choice of brews. Served with your choice of Draught Beer or a 250ml Glass of Red Wine. 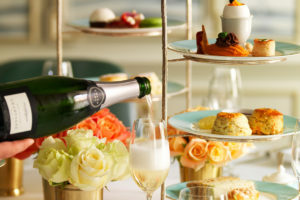 Make someone’s day with a delicious afternoon tea. 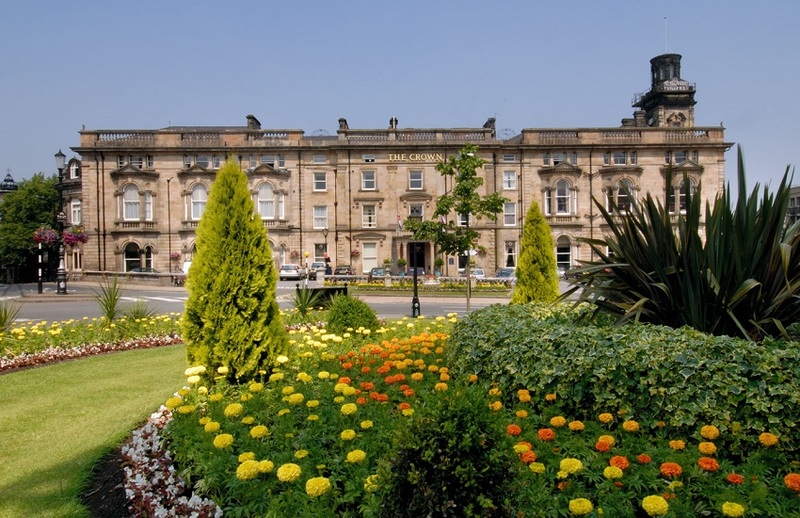 In a beautiful central location, the Crown Hotel is a few minutes walk from Harrogate’s most popular sites and is perfectly placed to explore the city’s Turkish Baths, beautiful Valley Gardens and picturesque town centre. With its fascinating antique shops, richly historic Victorian arcades and diverse boutique shops, it’s a great town to explore on foot. A superb venue for a weekend break, family holiday or with its close proximity to Harrogate International Centre, ideal for a business trip – but why would you not want to stay a while longer? With a formidable culinary reputation, the talented team of chefs at the Crown Hotel enjoy sourcing fresh produce from local suppliers. 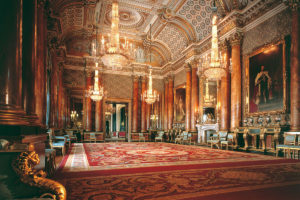 Hearty breakfasts are served in the historic Churchill Suites of the Crown, featuring oak-panelled walls, stained glass windows and ornate ceiling decorations. The Place is the place to be for informal dining throughout the day. Light bites, an extensive wine list and themed culinary nights throughout the month will keep your taste buds drooling. The genteel surrounds of Henry’s Bar provide a relaxing environment for a night-cap and a delicious range of snacks. With 114 individually style bedrooms, each with its own unique charm, not to mention luxurious bed linen and soft, Egyptian cotton towels, the hotel can happily accommodate larger bookings – perfect for weddings, business events and family affairs. 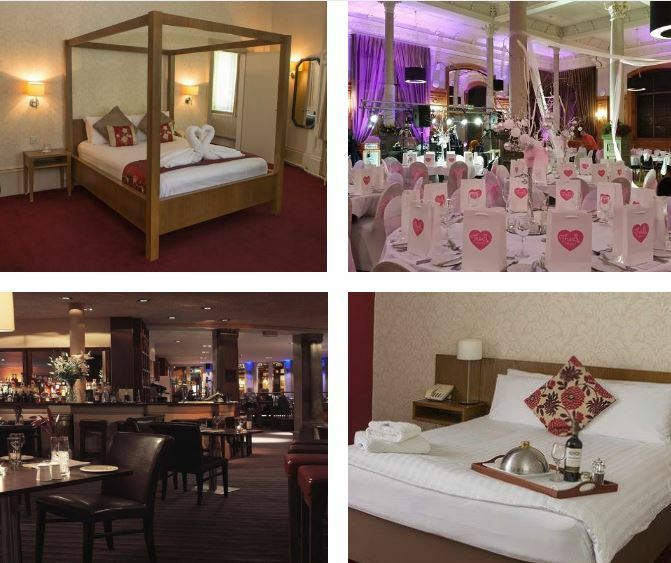 With a range of gift vouchers, the Crown Hotel is a beautiful venue to treat someone to a fine dining experience or romantic stay. 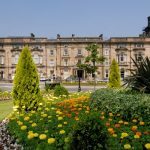 Take a moment and discover The Crown Hotel, Harrogate. To book afternoon tea at the Crown Hotel, or for further information, simply select the Book Now button below.